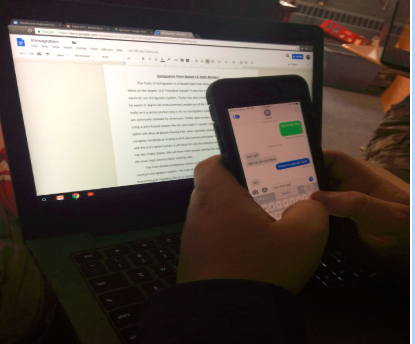 All year, and increasingly so, Newfound Regional High School has struggled to connect to the internet. NRHS internet is one that crashes a couple of times a week, despite how many upgrades are made. The school currently runs on a First Light Fiber Optic Network. This allows more devices in the school to connect to the internet. Previously, the system could account for enough devices if everyone in the school had one device. However, many people now have more than one, usually a laptop, a phone, and/or an iPod, all of which use the internet. In order to connect everyone’s original device and then a second device, the system needed upgrades. Think of a three lane highway, and every device in the building is a car on that highway. The flow of traffic is slow because there are so many cars. It’s the same with the internet. With the new system, it’s like opening up another two lanes on that highway. Traffic moves faster, and you can accommodate more cars; in other words, more devices can connect to the internet. A biggest issue students and staff alike have with the internet is that is constantly goes down. The problem is, it’s only pockets that go down at a time. Sometimes it’s just the printers; other times, it’s entire sections of the building. In today’s generation, the internet and technology have become a necessity to everyday life, almost like the air needed to breath. Though it is less a life-line requirement, and more of an abused addiction. The constant need to connect to the internet is comparable to any addiction. When not connected, people struggle to cope because people are so reliant on access to the online universe. Unfortunately, the current VPN issues at NRHS cause that air to stifle and suffocate learning for all.